This record event in Nayarit is a huge step forward for the creation of the Jala-Bahía de Banderas Highway as a tourism thoroughfare with high environmental value. The Alianza Jaguar placed the first GPS collar on a jaguar in Sierra de Vallejo, located in the heart of the Riviera Nayarit, on December 21, 2015. This is a very important step in the right direction that will serve to—among other things—define the fauna trails of the Jala-Bahía de Banderas Highway. “It was a huge challenge due to the difficulty of capturing an animal of this magnitude with all the care needed to keep it safe, collaring it and setting it free. On top of that it had been raining for the previous few days, which changed our plans, but we finally did it,” shared Erik Saracho, Director for the Alianza Jaguar. This is the third capture attempt that has been set into motion for the placement of the five publicized GPS collars. It’s important to point out the second attempt ended with a collared puma, another top predator with less mobility but nonetheless very important for the ecosystem for its contribution to natural selection. 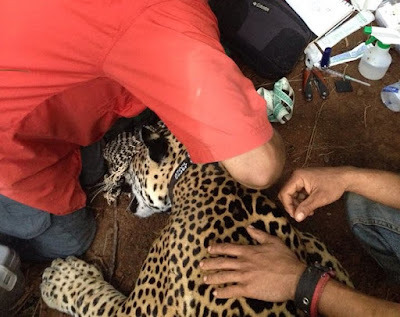 The event included the participation of biologist Dr. Rodrigo Núñez, veterinarian Octavio López, wildlife photographer Alejandro Prieto and jaguar tracking expert Antonio Rivera, all of whom flew in from different cities in Mexico. Local guides and ejidatarios, the true area experts, also joined in the capture, guaranteeing the security and success of the participants. A few days after the event it was noted the specimen had already moved nearly two miles, the collar was functioning well and had been attempting to send seven monitoring points daily, depending on the conditions. “We’re committed to immediately transmitting the information we’re receiving to the Transportation and Communication Secretariat (SCT by its acronym in Spanish) and the Department of Environment and Natural Resources (Semarnat, by its acronym in Spanish) in order for them to compare it with the environmental impact statement they have,” added Saracho. The Riviera Nayarit Convention and Visitors Bureau would like to congratulate the Alianza Jaguar for this unprecedented effort in Nayarit. Erik Saracho indicated that the fourth capture event would take place January 15-25, 2016 to continue the placement of the remaining three GPS collars.